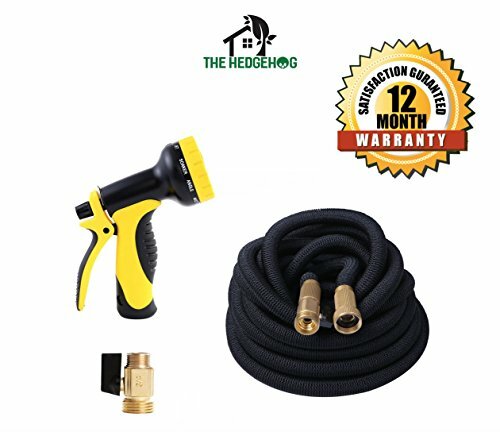 The Hedgehog's premium-quality expanding garden hose comes with a 10-setting nozzle sprayer and brass valves. Best hose set on the market! We offer this product in multiple sizes including 100 ft hose, 75 ft hose, 50 ft hose and 25 ft hose. Replace your traditional, inefficient garden hose with the Hedgehog expanding garden hose. This water hose is known for its reputation of providing consistent, continuous high-water pressure; multiple water settings from mist to a jet from the hand-held sprayer; durability; ease of use; ease of transportation; lightweight and comfort. We believe in offering high-quality products at fair prices to create the best user experience. This is a must-have product for your watering needs and garden tools! Customer satisfaction guaranteed. Flexible Garden Hose Pipe The hose expands up to THREE times its length with water and will easily contract to its original shape without kinking when the water is turned off. This flexible garden hose is one of the highest quality and most efficient garden hoses on the market. Also alleviates the pressure of finding hose storage. Purchase and say goodbye to the traditional, cumbersome rubber garden hose! Brass Fittings Superior to plastic or aluminum fittings. Our brass fittings are considered the premier choice for durability and longevity of high-pressure garden hose fittings. Our fittings are standard 3/4" with 100% brass ends. These solid brass fittings which will not break, crack, leak or corrode. Money-back guarantee. Multi-Layer Woven Casing Strongest and best garden hose available with multi-layer woven casing. This hose is made with a high strength, tough outer woven casing, allowing for high water pressure. This hose works with any standard faucet in the United States. It can be connected to most spray nozzles, sprinklers or other hoses. PREMIUM QUALITY: One of the best garden hose sets on the market! Set includes flexible hose pipe, spray system and garden hose fittings! A must-add for your gardening tools. Strong, expandable, and high quality, this garden hose set comes with a 10-setting garden hose nozzle, an expandable garden hose pipe and brass valve hose pipe connectors. GUARANTEED LONGEVITY: This flexible garden hose set has an incredible long-working life and includes a 12-MONTH GUARANTEE. We believe this expandable garden hose set is superior compared to its competitors. We use a tough, durable outer casing for our expandable hose pipe allowing for continuous strong water pressure. We are confident that our garden hose fittings made of solid brass will not break, crack, leak or corrode. Try it out! FLEXIBILITY: The water hose pipe can expand up to THREE times its original length easily and efficiently. It also can retract down to its original shape for easy storage, all without kinking! No garden hose reel is needed. Garden hose storage made easy. Comes with built-in shut-off brass valve which saves you trips to the faucet. ON/OFF valve located on the end for convenient use. LIGHTWEIGHT: 100 ft hose weighs less than five lbs. Very lightweight so you can take this expanding garden hose anywhere! TEN WATERING PATTERN HOSE SPRAY NOZZLE: Ten watering spray system settings: JET, CONE, SOAKER, FLAT, CENTER, FULL, ANGLE, SHOWER, MIST, and ½ VERT. Turn the hose sprayer dial to choose appropriate pattern easily. The water hose nozzle fits comfortably in your hand and will not slip. We believe it's the best water hose spray nozzle on the market. This set makes watering your garden, washing your dog, cleaning your windows and other outdoor activities much easier and fun! If you have any questions about this product by The Hedgehog, contact us by completing and submitting the form below. If you are looking for a specif part number, please include it with your message.